As God’s chosen ones, holy and beloved, clothe yourselves with compassion, kindness, humility, meekness, and patience. as it was in the beginning, is now, and will be for ever. Amen. Alleluia. but with the unleavened bread of sincerity and truth. Alleluia. death no longer has dominion over him. but the life he lives, he lives to God. and alive to God in Jesus Christ our Lord. Alleluia. so also in Christ shall all be made alive. Alleluia. I have no peace, because of my cares. and make my lodging in the wilderness. but trouble and misery are in the midst of it. its streets are never free of oppression and deceit. then I could have hidden from them. my own familiar friend, dear to my own heart. and walked with the throng in the house of God. for wickedness is in their dwellings, in their very midst. and the LORD will deliver me. and the LORD will hear my voice. for there are many who fight me. they never change; they do not fear God. but with war at heart. but they are drawn swords. the LORD will never let the righteous stumble. down to the pit of destruction, O God. but I will put my trust in you. from the seed of a man and the pleasure of marriage. O skies and lakes and ponds and rivers. O fog and snow and rain. Who peek out from winter’s brown death. O sticky mud and late March snowstorm. O frogs and crawdads and tadpoles. and all you cattle and sheep. for its temple is the God of surpassing strength and the Lamb. for the glory of God shines on it, and its lamp is the Lamb. and the rulers of the world lay their honor and glory there. into it they will bring the honor and glory of nations. flowing from the throne of God and of the Lamb. and the leaves of the tree were for the healing of the nations. there they will see God’s face, whose Name shall be on their foreheads. your kingdom come, your will be done, on earth as in heaven. Forgive us our sins, as we forgive those who sin against us. Save us from the time of trial, and deliver us from evil. For the kingdom, the power, and the glory are yours, now and for ever. Amen. Christina Rossetti, by her brother Dante. Her entry in Holy Women, Holy Men, the Episcopal Church’s book of saints, is a concise yet sweeping overview of her life and times: 19th century Britain, a period of rapid industrialization, the creation of a new middle class, the abandonment of the countryside, the squalor of urban slums – and cultural, religious and artistic reactions, including nostalgia for the way things were. Dante Rossetti started a Pre-Raphaelite Brotherhood; Christina wrote 500 devotional poems on the sacramental things of the earth: bread, oil, water, wine. 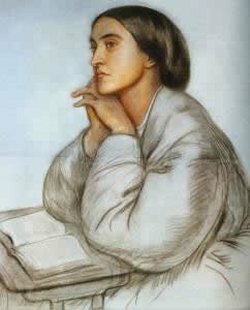 O God, whom heaven cannot hold, you inspired Christina Rossetti to express the mystery of the Incarnation through her poems: Help us to follow her example in giving our hearts to Christ, who is love; and who is alive and reigns with you and the Holy Spirit, one God, in glory everlasting. Amen. 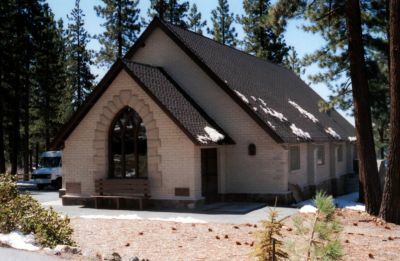 St. John’s in the Wilderness, Glenbrook, Nevada, on the shore of Lake Tahoe. Almighty God, you have given us grace at this time with one accord to make our common supplications to you; and you have promised through your well-beloved Son that when two or three are gathered together in his Name you will be in the midst of them: Fulfil now, O Lord, our desires and petitions as may be best for us; granting us in this world knowledge of your truth, and in the age to come life everlasting. Amen.